California’s booming CBD industry is in disarray after the state Department of Public Health (CDPH) reaffirmed earlier this month that CBD cannot be added to food, even if it comes from hemp. “It’s a real punch in the stomach,” said Chris Boucher, who is growing 60 acres of hemp in Southern California, most of it destined for CBD extraction. The source of the CBD, whether from marijuana or industrial hemp, does not matter. CBD would have to come from people with “commercial cannabis licenses,” something many hemp-derived CBD processors and manufacturers in California do not have. Marijuana retailers must use marijuana-derived CBD in their products. Hemp-derived CBD is specifically banned in manufactured cannabis products, according to Dana Cisneros, an attorney with Cannabis Corporate Law Firm in Anaheim Hills. “While I disagree with the state of California’s position and approach to hemp-derived CBD – given that it is the same molecule – the law is clear and the FAQ released by the CDPH-FDB confirms the hemp-derived CBD cannot be lawfully added to a food, food product or dietary supplement,” Cisneros said. “This is devastating for small businesses in California that rely on hemp-derived CBD. This is devastating for patients that cannot afford to purchase cannabis-derived CDB products sold in BCC licensed retail establishments. “And it is nonsensical,” she said. The state health department said it’s following guidance from the U.S. Food and Drug Administration. 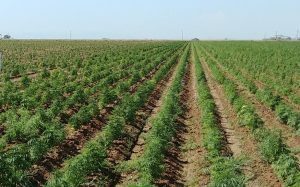 “Until the FDA rules that industrial hemp-derived CBD oil and CBD products can be used as a food or California makes a determination that they are safe to use for human and animal consumption, CBD products are not an approved food, food ingredient, food additive or dietary supplement,” the California agency noted. CBD manufacturers in California say they’re reeling from the announcement, released as an FAQ on the California Department of Public Health’s website. “It’s not fair,” said Dave Hargett, owner of Innovative Nutraceuticals, which has made CBD-infused lozenges and tinctures since 2013 in Lake Elsinore. The health department did not immediately answer questions from Hemp Industry Daily about how the rule would be enforced. But CBD producers in California are scrambling to find other options for selling their food and drinks containing CBD. “We’re going to have to grow and diversify much faster out of California,” said Jonathan Eppers, owner of Vybes, a San Diego company that makes CBD juice drinks sold in roughly 500 California retail locations, including gyms. The situation also has compounded existing confusion on the marijuana side of the industry for retailers licensed through the Bureau of Cannabis Control (BCC), which prohibits its licensees from selling hemp-based CBD products. “The Medicinal and Adult-Use Cannabis Regulation and Safety Act (MAUCRSA) applies to cannabis and explicitly excludes industrial hemp from the definition of cannabis,” said Alex Traverso, spokesman for the BCC, in an email. While that’s the current status, a “conversation about these CBD products” needs to be had, BCC chief Lori Ajax told a crowd of marijuana business executives during a Mendocino County retreat in June. “We need to figure out a way to get that regulated through the normal supply chain,” Ajax said. Many licensees either don’t understand the prohibition or aren’t aware of it, said Debby Goldsberry, executive director at Magnolia Wellness in Oakland, a licensed microbusiness that previously carried hemp-based CBD bath balms and pet products. Goldsberry pulled all her hemp product inventory in order to be as compliant with state rules as possible. But not every licensee is following suit. Patrick Goggin, a San Francisco attorney who represents hemp producers, says it’s not time to panic yet. His firm, the Hoban Law Group, believes California’s CBD rule contradicts the definition of hemp elsewhere in state law. “Everybody ought to take a breath,” said Goggin, who pointed out similar pronouncements in Indiana, Wisconsin and Texas – CBD limitations that have all been either reversed or put on hold. Boucher, the hemp farmer with 60 acres growing, said the health department makes no mention of extracting CBD from hemp, meaning he could sell the isolate or extract to out-of-state food processors. John Schroyer, who covers the California cannabis industry for Marijuana Business Daily, can be reached at [email protected]aily.com. What I don’t understand is how the FDA can state that industrial hemp and cannabis are different they’re not. They are the same damn thing cannabis is cannabis is cannabis. And I think that we should just get together and everybody file lawsuits against the FDA how can they approve GW Pharmaceuticals cannabis based medicine when they won’t allow anybody else to sell it that’s a monopoly. This is just boiling my activist blood I so want to come down there and straighten this out unfortunately my activism days in my fight for the legalization of cannabis it really knocked the crap out of me LOL I’m still trying to recover and unfortunately I seem to have been forgotten by most people in the industry not very many stories out about club420 fighting westnet which was just one in many things we accomplished we first time almost everything in this industry. First building permits for cannabis grow rooms, first to advertise online, first cannabis on an airplane, first live cannabis displayed at Hempfest, we started patient verification, you name it and we were the first to do it and we changed the world. Almost every news story about our cannabis bar which was the first in the world by the way that actually portrayed me is a semi intelligent caring individual are non-existent you can’t find them anywhere all the video recordings of the council meetings ACLU meetings they’re all gone only the bad stuff the false accusations those are the only ones you can find online. According to their federal definitions, hemp is defined to be the type of cannabis with ultra low THC, while marijuana is defined to be derived from cannabis regardless of THC, although how, is unclear. The DEA strategically misconstrued the meaning of the term “marijuana”, but the SCOTUS replied, “If that is the way the Agency sees it, well OK.” It is not OK. In short, the constitutionally correct view is that marijuana is not a plant, and marijuana is not a drug, but marijuana is the “other substance” in Schedule 1. The long version is a literal reform of the circumlocutory federal definition of marijuana, to point out its adumbrated meaning, retain the constitutionally valid prohibitions which are a result of its Schedule 1 status, and acknowledge the recreational, medical, and industrial values of cannabis, while bypassing the issue of the temporary Schedule 1 status of marijuana. CA is protecting their regulated market, while denying entrepreneurs and the people they serve. The State of California is willing to sidestep the Controlled Substances Act, as they should, but will bow down to the FDA? That proves it’s a financial decision, not a sensible decision. God forbid they should lose out on 15% taxes, while forcing patients to overpay in Retail Outlets for simple CBD. CBD manufacturers/ marketers should be outraged. I am a CBD manufacturers/ marketer and I am more than outraged!!! disgusted!! Hemp Seeds have been added to food for years. Sold in health food stores incuding whole foods. Why not Hemp CBD. Hemp seeds ARE food. on top of cereal, blended into mashed potatoes, toppings for pies, etc. This is the same state that wanted to have cancer warnings on coffee until the World Health Organization and FDA pointed out the truth. CBD boasts a number of skin benefits because it’s rich in fatty acids and natural emollients that can help hydrate and smooth the skin. Its anti-inflammatory properties are also excellent for soothing aches and pains, as well as treating irritated skin conditions like eczema. but this webpage gives feature based content.